This is the 22nd in a series of reviews dedicated to the concept of 32Ohm Audio as embodied by the store of that name in downtown Portland/Oregon and described here - Ed. The planned NuForce Reference 18 monaural amplifiers will set you back a cool eight grand a pair. That's new turf for the value-conscious company. At $449, the HDP in the now familiar NuForce Icon chassis is entry-level. Actually, upper entry level. For NuForce. Their Icon offerings previously topped out at $249. NuForce calls the HDP the "crown jewel" of their Icon range. The HDP is a wall-power desktop solution small enough to accompany traveler baggage for lone hotel nights on business trips or vacations. It combines a 24/192 D/A converter with 24/96 USB input, a headphone amp and a preamplifier in a slim 6 x 4.5 x 1" black or silver aluminum extrusion that weighs just one solitary pound. It can go vertical with the included silicone stand—the input selector letters are oriented accordingly—or horizontal. If the latter, affix some rubber bumpers on the side that becomes the bottom. The external standard power supply is a universal 28W/15V/1A Chinese switch-mode affair and as short as the palm of my hand. A 45W/15V/1.6A unit is an upgrade option for a bit more power and current. The PSU umbilical is nearly 2 meters long, with a standard IEC for the wall-connection power cord. Audio inputs include B-type USB, MacBook-style 3.5mm mini optical digital/analog (adapter included), coax digital and RCA analog. The front identifies these inputs as U, D and A. Variable outputs are a 6.3mm headphone socket with included mini adaptor and one pair of very high-quality RCA pre-outs. For headfi, gain and drive are more than sufficient for even the inefficient 37-ohm HifiMan HE-5LE orthodynamics. Hence AKG K-702, beyerdynamic T1, Sennheiser HD800 and other beefier loads are all—think maverick chef Gordon Ramsay of The F Word—served. While I don't own ultra-efficient IEM 'phones, owner commentary on the forums, on the Westone 2, 3 or ES3X and UE 11Pro and JH13Pro, report zero noise. 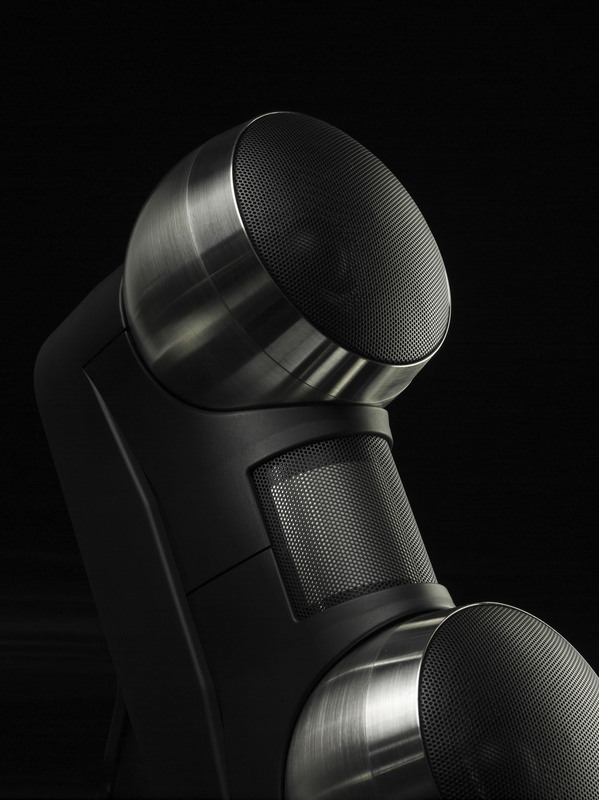 That's not a given with headphones amps powerful enough to drive full-size on-ear designs. Though portable amps routinely have just enough juice to play such loads, they just as often lack the raw drive to do better than simply play loud enough. Doing it and performing, optimally, are far from synonymous. I'll report on what it means here. For hard power figures, the headphone port provides 288mW into 30-ohm loads like the HE-5LE. 96mW go into the 600-ohm Tesla 1s and 16 ohms would see 1.2W up to 4.5V RMS before clipping. Frequency response is down half a dB at 100kHz and the S/N ratio books another 100 (in dB). NuForce is proud to state that the digitally fully differential HDP runs four of the same 24/192 DAC chips that are in their $1.450 CD player for shared genetics. 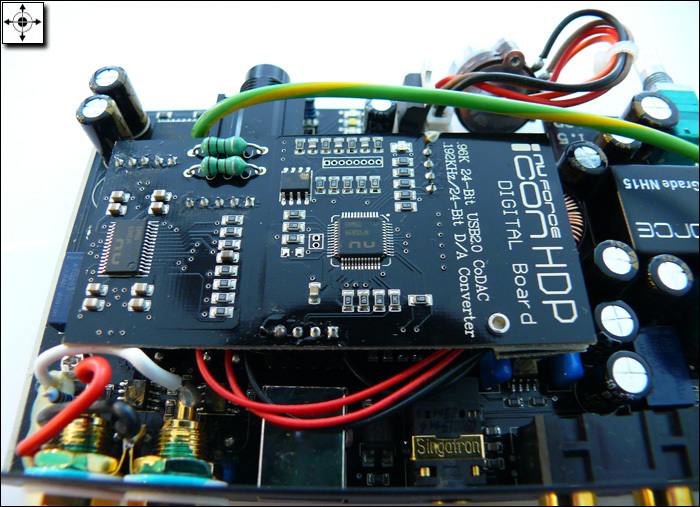 Sitting on a discrete daughter board [below], the HDP converter uses a direct-coupled digital input with an I²S full-speed USB2 path. 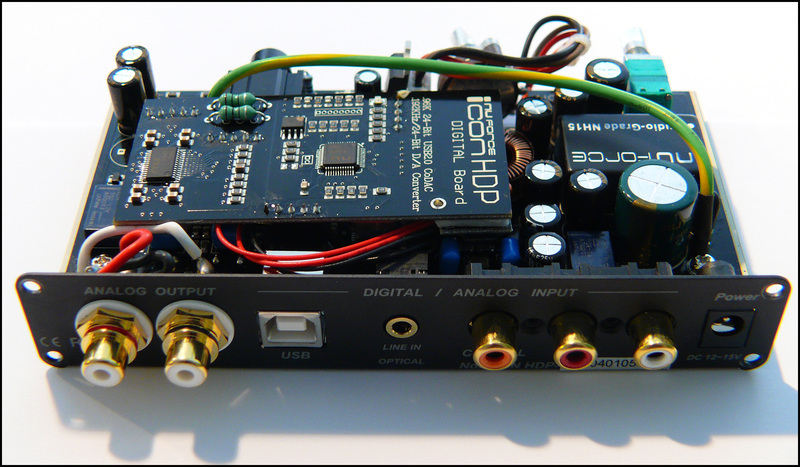 While the S/PDIF and 3.5mm optical inputs process 24/192 feeds, the USB input is limited to 24/96. The analog output stage is reportedly similar to the $1.650 Nuforce P-8S preamp. Digital and analog supply voltages are separately regulated and isolated. Otherwise Jason Lim calls it "a feature-packed and painstakingly careful design revised many times during R&D as we kept adding features and perfected the implementation. We typically do not disclose parts to avoid helping competitors. Most critical parts here are either rebranded or had the markings removed. Some might be custom designed for us. Also, people often draw the wrong conclusions if we disclose parts. It invites all sorts of—right or wrong—comparisons and conclusions. We'd rather have them decide on the basis of audible performance." Casey Ng added that "the key to the HDP is its very unique USB 24/96 transceiver. The USB chip looks at the incoming signal, determines the sample rate and then applies the internal phase-lock loop which is a specially engineered clock generator with very low jitter for audio usage. As soon as a lock is obtained (a few mseconds), the HDP uses this internally generated clock to not track the PC's clock. Hence the HDP is not at the mercy of the PC's USB clock and immune to the jitter. The USB transceiver outputs I²S data directly to the DAC. The S/PDIF inputs are subject to a top-grade S/PDIF receiver and we do run the digital signal without any upsampling or sample rate converter. 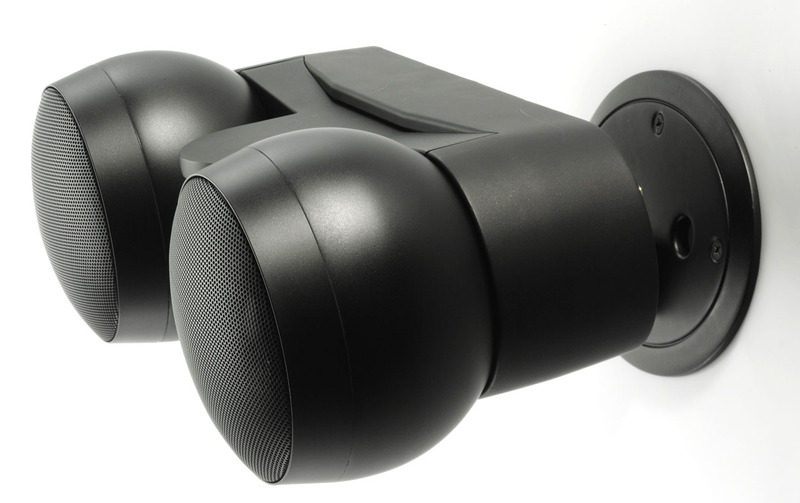 In our opinion an SRC impacts the audio quality negatively. The same non-SRC approach is used in our CDP-8. "The analog output stages are op-amp based while the headphone stage is a very special class A IC (not an op-amp) that powers up as soon as the AC connection is made, i.e. even with the power knob in the 'off' position. 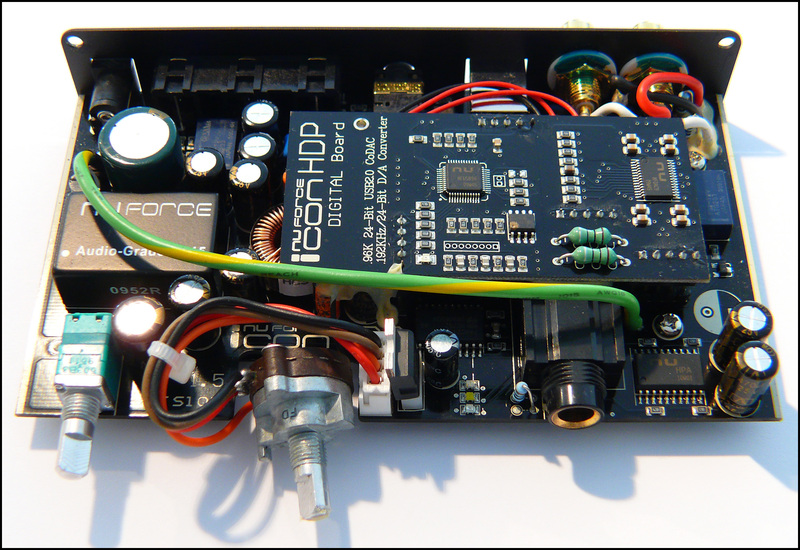 In our opinion, opamp-based headphone amps do not have the drive capability to cover from low to high load impedances. The signal paths are such that the differential DACs' two balanced outputs (i.e. +ve and -ve per channel) run into a differential first stage for common-mode DC rejection without degrading DC decoupling capacitors. The signal then drives the high-quality volume control and the output of the volume control feeds another opamp stage as the output for the preamp or links to the headphone stage. Both the headphone stage and preamp output are as pure as possible without unnecessary buffers. The preamp output buffer is necessary of course or else the volume pot's high impedance wouldn't properly drive the RCA outputs. 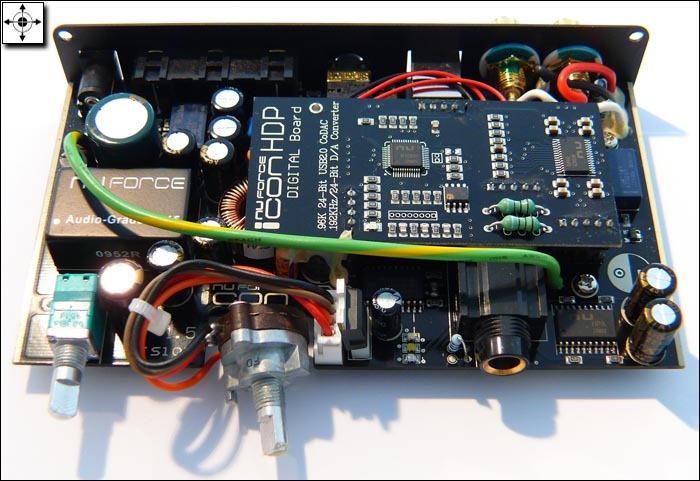 Now a differential opamp drives the impedance imposed by the volume pot to reduce any degradation. You should hardly hear any difference in sound quality at different volume levels. The class A output stage has a bandwidth of nearly 1MHz and a very low THD in the 0.00x% range under all supported load conditions. Preamp output is 2.3Vrms max, the headphone output can swing a max 8Vrms into high impedances (subject to loading of course - low impedance swings are far less). Output impedance on the pre-out is 100 ohms. Preamp gain is x 3.3 and approximately x 8 on the headphone output." For the money, the HDP is very nicely finished and its knobs respond with reassuringly firm clicks for the input selector and smooth action for the volume control which doubles with one click as the power switch. A small red power LED (blue with the USB input, white with the digital input) confirms operational status. Because the power supply is separate, diehard tweakers can upgrade it or even go bonkers and batteries à la Red Wine Audio Black Lightning.